From heading steep and deep to cruising fresh powder groomers, the full stretch Immensity Jacket meets the needs of skiers of all abilities with user-driven features and trusted technologies. Built of breathable, water shedding ARED VO2 10,000 fabric lighted wadded with high warmth insulation. Designed to be well-fitting yet roomy where needed for freedom and movement. The hood has two-way adjustors for customised coverage and visibility, and the snow skirt features soft, gel gripper tape to block powder. Pockets, including one for your ski pass, secure with neat zips. Waterproof: Dare 2b's Ared fabrics are guaranteed to keep the wet out. Extra Breathable: Our Ared V02 10,000 and 20,000 fabrics offer extra breathability and comfort even in extreme wet weather conditions. Durable Water Repellent: A long lasting durable water repellent treatment is also adhered to our top fabrics to ensure liquids roll of the surface. 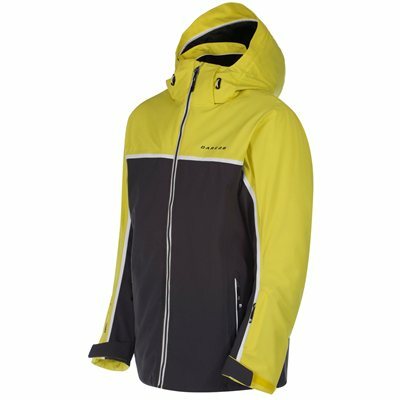 Windproof: Once the wind rolls in a sunny day on the slopes can turn cold in a flash. Ared fabrics are designed to be windproof so you can't feel the chill. Stretch: Some of our Ared fabrics also come with stretch whether that be in full or part stretch, we have strategically placed panels to ensure you never feel restricted.